In my latest bit of old-house news, we’re redecorating the library. This upstairs room — it was previously a bedroom — had become a catch-all for newspapers, magazines, CDs, antiquated VHS tapes, and too many books for our existing bookcases. The library’s best feature? 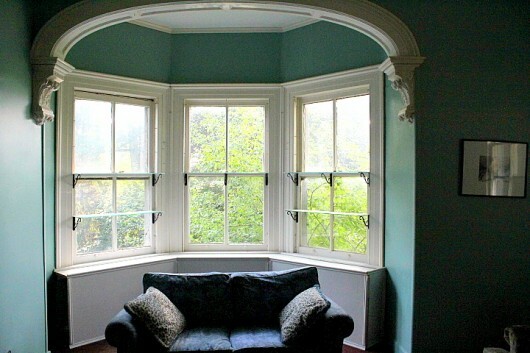 A bay of three windows, created by the turret that runs up the east side of the house. 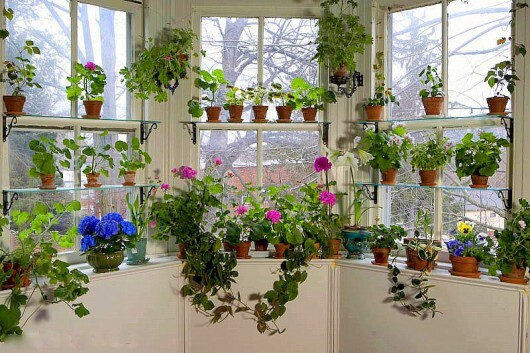 Several years ago, I equipped the window with glass shelves for the wintertime display of flowering houseplants. The plants are vacationing outdoors just now. Unfortunately, the rest of the room resembled a scene from “Animal House.” The only things missing were some pizza boxes strewn about the floor. Consequently, you can’t imagine my excitement when Silver Fox said he’d let me declutter and decorate the room. Oh, what visions of beauty popped into my head! Or this. 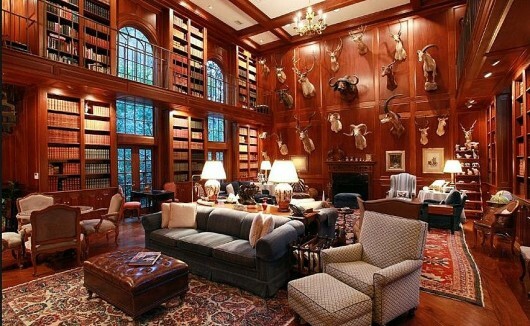 But minus the hunting trophies. I suspect this library belongs to a certain dentist. 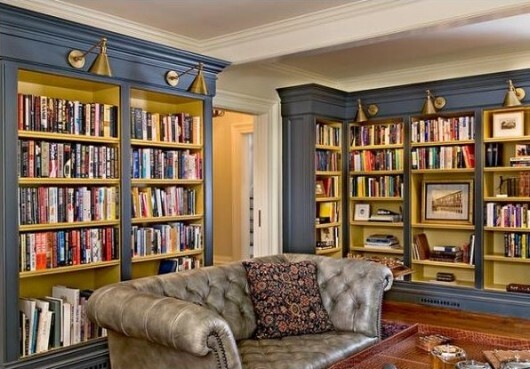 Alas, my dreams of paneled walls and floor-to-ceiling bookcases were promptly dashed. The Silver Fox told me that any such extreme makeover would put us in the poor house. Oh, well. A boy can dream. Unlike our parlor, dining room, and music room (above), the library isn’t a “public” part of the house. We don’t use the room for entertaining. Still, the cluttered bookcases set my nerves on edge. New carpeting seemed the logical first step towards improving the library. Why? 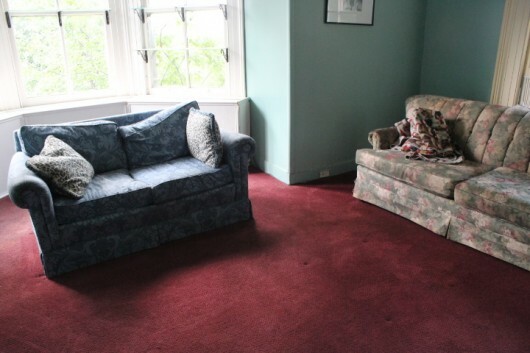 Because before the old carpet could come up, and the new version could go down, we’d have to empty out the room! And when you empty a room, you feel inclined to get rid of the things you no longer need, want, or have room for. That’s what “deep cleaning” is all about. 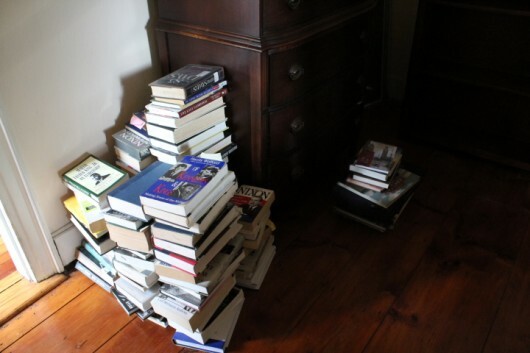 At a minimum, we eliminated one hundred books. Some of these will be donated to local libraries, while others will be deposited in the book-recycling bin at Habitat for the Humanities. We said “buh-bye” to the unwanted DVDs and VHS tapes. And laid down the new, beige-toned wall-to-wall. The carpet is specially treated to resist stains of all kinds, including those from a certain beagle. 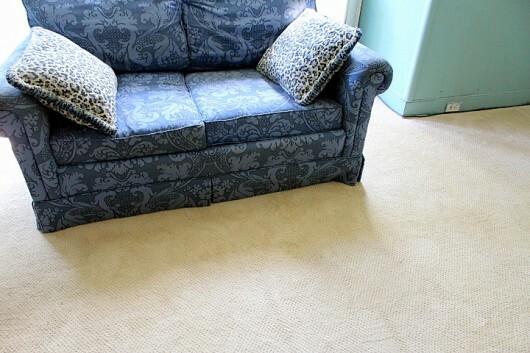 The padding beneath the carpet is water-proof. Decoration is far from complete. But thanks to our decluttering efforts, we now have 2 empty shelves on the north wall bookcase! 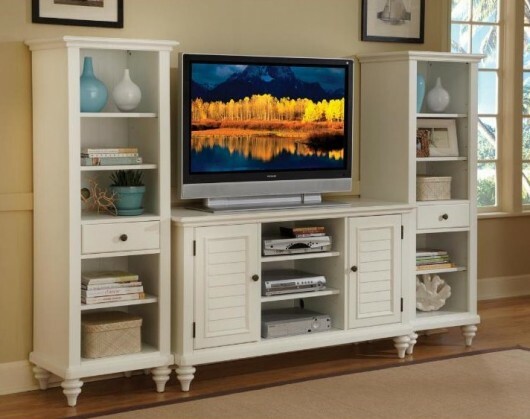 Do you have a proper “entertainment center” in your home? I mean, a piece of furniture that houses your flat-screen TV and its components? Then I want what you have. 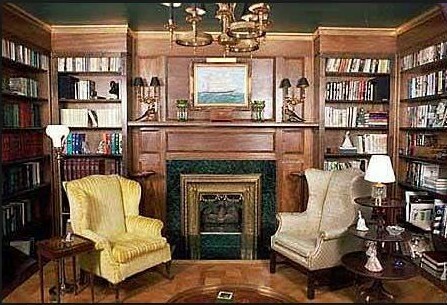 Or, at least something similar to the 3-piece media center pictured above. We made still more progress on the library’s west wall. As you can see, there’s plenty of room for more bookcases there. And believe, they are coming. I’ll keep you posted on the library’s progress. Meantime, let me know if you have any decorating or decluttering projects you’d like to tackle in your own home. As always, I love hearing from you! Don’t miss anything at A Garden for the House…sign up for Kevin’s email updates! For media center on the cheap: visit thrift store of your choice; buy an old but sturdy dresser; discard drawers or dream up a nifty new use for them–root cellar storage, plant flats, etc. ; install shelves in dresser and maybe louvred or other style doors; add fancy pants legs if desired; refinish or paint. Voila! Have spent today uncluttering kitchen, which was strewn with several peck baskets that recently held fruit, junk mail, magazines, empty jars, you name it. Made apple crisp from the last of peck basket apples, stowed all the baskets in a room I have to declutter before I need to pole vault to the bookcases. Kitchen looks great though. Saving pole vault room for winter. 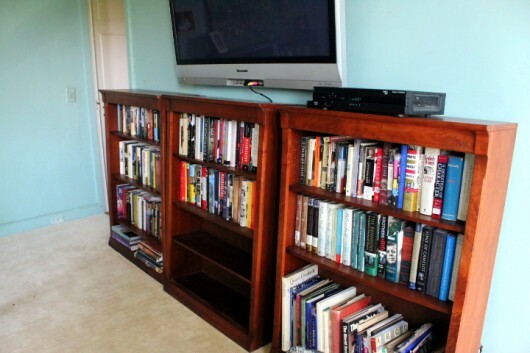 Mary – Love your idea of creating a media center from an old dresser. Bet I could do just that. My next project will be the annual “deep cleaning” of the kitchen. Gotta make space for the myriad cookbook props I’ve been accumulating! Take a trip to an unfinished furniture store. Find the bookcases in the height and width you want or need. Then paint them inside and out in colors that you love. Add some lighting and comfy chairs (you can probably find some wing chairs at a consignment shop) some nice botanical prints for the walls and add plump new pillows! As a retired librarian, I’m tempted to get out the magnifying glass and read the book titles in your cases. A great project to use extraneous books is to install a “Little Free Library” close to the sidewalk where borrowers can browse and select books. I put one in this year, and when I noticed a lot of children using it, I added a little statue of “The British Reading Fairy” in the middle of a clump of large hostas nearby. Kids from 4 to 89 love it. If it delights and sparks imaginations, it’s worth the slight effort. The pole vault room has about 20 boxes of books that haven’t been opened for 17 years. The LFL is going to be well stocked after my winter decluttering. I love the idea of shelves from an old dresser! I just moved into a new house, and every room except the laundry room needs to be painted. Most of them are a dreary taupe color with a tinge of pink, and the kitchen is a brickish pink color with a tinge of taupe. Yuck. Then I need to replace most of the light fixtures and some of the window coverings. After that, I’ll be shopping for guest bedroom furniture. And that’s just the inside. There are vegetable garden beds to build this fall, perennials to plant, etc. I’ll be stopping by for ideas and inspiration often. We spent quite a few hours in July collecting and pricing items for a yard sale and then ran it for 4 days across 2 weekends. We sent many items to new homes. We have new-found space in all rooms of the house. It was only the tip of the iceberg, more’s the pity. I had a beautiful and massive entertainment armoire built for me by a former beau at a time when televisions were far from flat. Alas, my beautiful armoire had to go because I recently inherited my uncle’s player piano and the only spot it would fit was the wall that housed the entertainment armoire. It was a good excuse to purge the old vhs tapes and dvd’s that were also housed there. My flat screen tv currently resides on top of the player piano…at least for the time being. Eventually I hope to mount it on the wall and frame it to look more like a painting. Then, when it’s not in use as a television, I can show a slideshow of Tom Thomsons or some of my other favourite art. My current challenge, however, is figuring out storage space for 150 piano rolls! Rosemary – Player pianos are WONDERFUL. My grandmother had one, but you had to pump two pedals to power the rolls. Lucky you to inherit the instrument and 150 rolls. Fun, fun, fun. Billy bookcases by Ikea. I have seen them modified with crown and base moldings to look like built-ins. Very inexpensive and flexible. They even have optional glass-front doors if you hate dusting. Well, I still haven’t sanded the floors or painted in the guest bedroom and it’s been torn apart for 3 years this December. Shame on me. To Durf above, don’t feel bad. I tore down wallpaper and wainscoting in my hallway 3 years ago and found out that 1 hallway wall and 1 dining room wall is made of particle board. We are not do-it-yourself ‘ers and paying a contractor to put up drywall has not been in the budget. I think we can finally swing it this year. It has been so long that I forget to even explain it to people who stop by. What they must think! Now decluttering is something I can do and I have been on a rampage lately finally overriding my kids’ vetoes on toys that have not been played with in over a year. I have also been motivating them by promising to finally set up a Lionel train layout that came from my childhood if we clear a nice space in the rec room. Ha! We had our kitchen re-done about 4 years ago, but decided we would finish the ceiling (tin was my dream) and the walls under the cabinets and the backsplash behind the stove. We now have about a third of the celing installed. If you don’t look up, the kitchen look marvelous! My decluttering this year was definitely going through my books (although i would love to have more bookcases, I don’t have room!) and getting some of them to the used book store and some of them to the free lending library we have at work. AND sorting through my yarn (yes, I am one of those knitting gardeners) and getting it out of my significant other’s office where it sat in bins all winter. There is plenty more to do, but it’s a start. Another idea for now-orphaned books: most senior centers have a lending library (our local one does). I recently gleaned my own stash (nearly as difficult and painful as choosing between one’s children), and took them to the senior center. I was told they also have a “keep” option for books people want to keep or pass on to someone else. I love the idea! 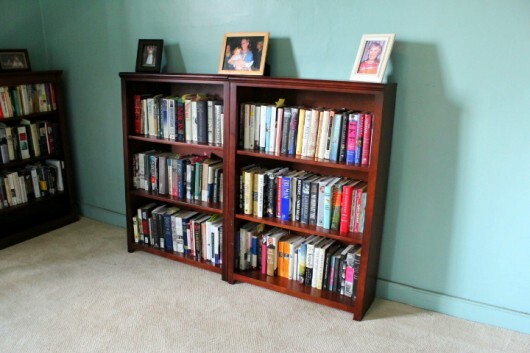 I would much rather buy bookcases and tweak them with shims for leveling and moldings to look built in, then waste valuable library wall space on an entertainment center. 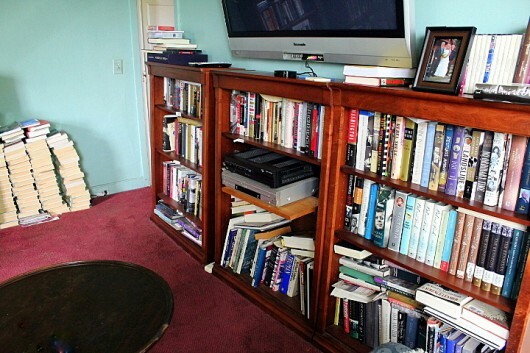 I would build the bookcases around the tv and above the tv. Below the tv I would maybe kick out a deeper cabinet if necessary. Perhaps use a beautiful deep rich paint for them so you can cover any lesser quality wood products you need to use or picture frame molding acting as paneling. If this is a private room that you use a lot then perhaps it should be the wonderful room you love to look at and be in. Treating your guests to the beauty of the formal rooms, and leaving your own everyday rooms less than beautiful doesn’t seem to be making your home feel as comforting as it could be. You are in these spaces daily, and visitors use part of the house occasionally. HONK! HONK! Yes I just love paneled rooms… and who doesn’t love wingbacks?? Rosemary’s Piano (wasn’t that a movie?) reminded me how I wish I knew what happened to my grandparents Victrola. 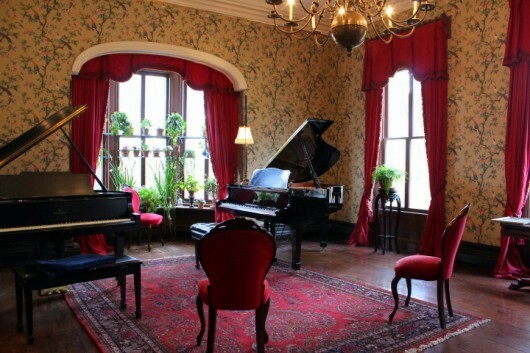 Then again if I had it, and the accompanying wax cylinders, I’d likely go Downton Abbey on a room… so…. We’re in the process of de-cluttering for a move next Spring, ugg. The most effective method has been having a few glasses of wine first to become far less sentimental about things. You are an inspiration… I have several areas that need serious decluttering… Starting today!!! feels so good to declutter… a week later…I can’t even tell you hat I got rid of!!!! Kevin, I love the bay windows in your library room. I can’t wait to see more pictures of the progress from your redecorating of that room. I feel very inspired to get busy decluttering some rooms in my basement that store lots of stuff. I recently inherited lots of things from my mom and dad’s house, which I did organize right away by getting big storage bins and some snap together shelving units which are in the basement. So now it is time to go through the rest of the basement, one room at a time. I like the idea of using an old dresser for other uses. Love the wall colouring you have used. We have an east and north facing “dim” family room in our home – was every colour white and pastel you could imagine. THEN my sister and I painted it a deep mallard green. Suddenly it became warm in the winter and cool in the summer. Deep tones work so well and look so elegant. And with your beautiful window it’s doubly appealing! About 15 years ago, my husband brought home his “office”. We had a garage sale to make room for a geology library. Sold a swack of paperbacks and ever since then, no read novel stays home. They get passed to friends or the library which either shelves them or puts them in their annual book sale. But the basement is another story. I pity our kids. What do you do with 24×36 of storage floor to ceiling with only a few pathways? I can keep the upper floors under control but just barely. Glad to see the maroon carpet disappear! Good job. i agree with Denise T. Consider your work now w/decluttering, new carpet and bookcases or entertainment center (on the cheap) a temporary situation. As the homeowners, if you are using that room it needs to feel as welcoming as the rest of the house. This is your PRIVATE space and bespeaks the real YOU. I have such gratitude that you’ve made me a seed starting enthusiast. Your blue wall color is just beautiful. I like your entertainment center idea and often see those for sale in NY on Craigslist. However our son, who collects books, built shelves in our old house that rest upon wooden corbels and he added more shelves as needed. He first placed his furniture, then worked around it. Everyone thought it was quite striking. If he had your beautiful room, I think he’d find simple corbels in a style reminiscent of the set that frames your bay window. You could work around the flatscreen, perhaps? Just a thought among many. Can’t wait to see your finished design! My husband is a woodworker so he made our bookcases and I purchased my entertainment center from a company called ” Amish Alley” on the Internet several years ago and I love it and the bookshelves my husband made for us. Love the new color. In some of your photos it appears aqua and in others it seems a robins egg blue. Could you please tell me color and brand of paint? Have been looking for just such a clear color for one of my rooms. With all the money you “saved” by not going with the paneling, I think the silver fox could be agreeable to a new entertainment center of your dreams!!! That’s a cool media piece you showed us, there. I’m thinking about those, as well. Right now I’m using a black, open-concept one I dragged to my apartment from the dumpsters. Yes, I drag things back and gently love them. It looks GREAT in here. Looks fabulous so far, Kevin! Keep up the good work and keep us posted! Have spent hours strolling thru your beautiful home….thank you. Could you share the color you used in your library? I’m wild about how it changes color. and used multiple shades throughout the house,plus hyacinth, pale yellows, aqua and salmon…..
don’t laugh, my husband calls it our crayon box. Decluttering is my ongoing goal. I’m not that great at it. costs less than having a carpenter do it from scratch? For decluttering, check out The Life-Changing Magic of Tidying Up by Marie Kondo. She advocates de-cluttering everything in the house by category: first clothes, then books, then papers, etc. I’ve just about finished the clothes … and am thinking, maybe this method works! When you put all your “stuff” into a pile by category, you get a real sense of just how much you have (that you really don’t need or want). She asks you to look at every item, one-by-one and ask yourself: Does this bring me joy? Do I love it? I’m a sentimental slob but you know, this seems to be working for me. Good luck! Keep us posted. It’s really a joy to read your blog. THANK YOU for the inspiration. I am starting to downsize my academic library. Would LOVE my home/Library to look like the photos. That you can get by on decluttering (which is about all I can afford) is an inspiration! I have purged in the past. Now this is not just purging but saying goodbye to a career! Marie Kondo: the life-changing magic of tidying up has been helpful. I knew how to purge and I knew how to categorize file. I did not know how to put objects in cabinets or on shelves. Her book, especially the last several chapters has been a life saver. So are stories like yours! Chuckle on the dentist comment. Looking forward to seeing the finished library! Here’s a link you might find useful, Kevin, for trimming out ready-made bookshelves (from Ikea in this case) to look like built-ins. It’s a cost savings and may give you some of that paneled elegance you’re looking for: http://centsationalgirl.com/2011/11/from-billys-to-built-ins/. 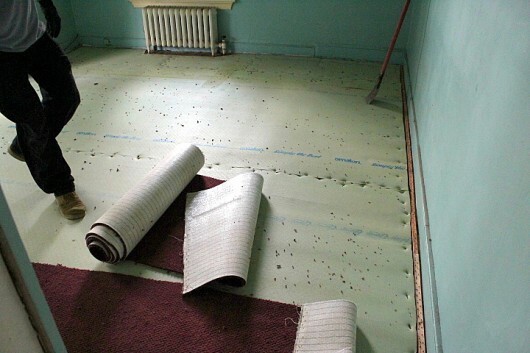 Love the way you’ve gently treated the restoration of your wonderful, old house! Hello Kevin, I have just taken a stroll through your beautiful home and garden. It is all just wonderful. We are in the process of cleaning out over thirty years worth of clutter from our home , trouble is our children have left things here and seem to turn a deaf ear to our requests to remove it. (that includes an old Rover 90). Still, inspired by your work I will push on and hopefully get to the end of it. I’ll let you know how we go. Meanwhile please keep up the gardening and cooking posts I just love them. Regards, Marion Graham.